The beautiful landscape of the Frenchman River Valley in the West Block of Grasslands National Park in Saskatchewan, Canada. When driving along the Ecotour through the spectacular landscape of the Frenchman River Valley in the West Block of Grasslands National Park in Saskatchewan, plan your adventure to be about two and a half hours in total. The landscape for the 28 kilometer round trip is a mixture of nature as some areas are barren white flats where very little vegetation grows but along the river, beautiful wildflowers blossom and wildlife is plentiful. The wildlife consists of antelope, bison, mule deer, black-tailed prairie dogs and hawks which feed in the river, on the grasses and berry bushes. The climate and conditions in Grasslands National Park play a major role in the ecosystems of the prairie landscape which is a protected heritage area. 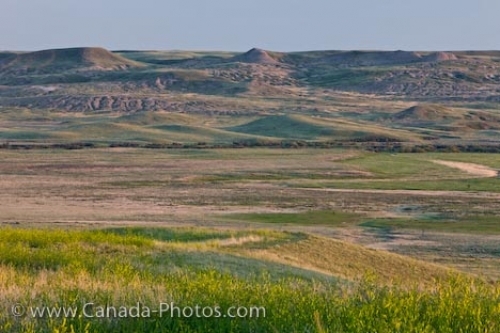 Picture of the unique landscape which makes up the Frenchman River Valley in Grasslands National Park in Saskatchewan.